The modern world is developing in full speed, so is the telecommunication industry. Not long ago 10GbE switch had been a luxury, so was exclusively affordable to large enterprises. And many individuals and businesses used 10/100Mb switch and could only get to gigabit switch for 1Gb backbone. However, this situation is changing due to price dropping and proliferating market demand. Now more and more SMBs and individuals are using gigabit switch and attempt to access 10Gb switch. As thus questions like whether to deploy gigabit switch as 1Gb backbone or 10GbE switch as 10Gb backbone has stirred heated discussion on many forums. This article is to give some reference for 1Gb backbone vs 10Gb backbone selection guide. What Is 1Gb Backbone Gigabit Switch? Simply put, 1Gb backbone refers to the networking configuration that gigabit switch is used in the data center as core switch. A typical scenario in 1Gb backbone configuration is to run 10/100Mb access layer switches with 1Gb uplink back to a central gigabit switch. In this case the 1Gb uplink on the 100Mb switch receives the 1Gbps from the switch gigabit, then divides the 1Gb bandwidth to its terminal endpoints. Restricted by the normal port 10/100Mb, max. 100Mb is available for access points. As thus 100Mb switch has gradually been obsoleted by gigabit switch. 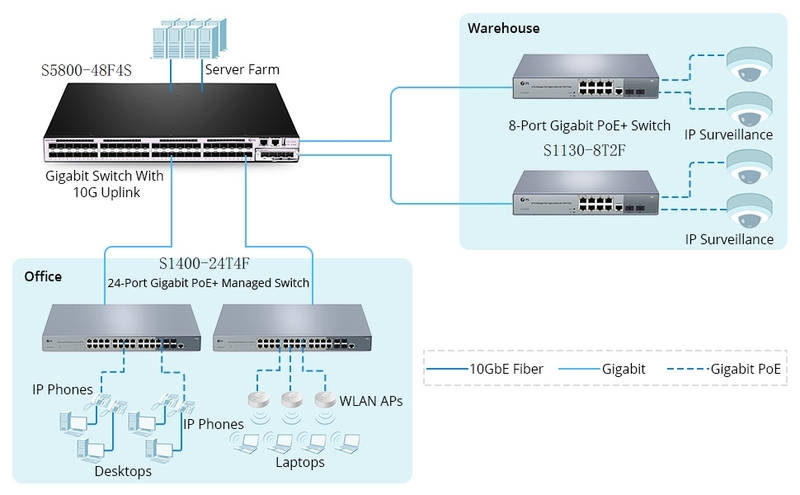 To achieve 1000Mbps and bring in PoE capability, modern operators often use gigabit PoE switch as access switch to cooperate 1Gb backbone gigabit switch. Here is a 1Gb backbone deployment scenario by FS.COM: Employing S5800-48F4S 48 port gigabit SFP switch as 1Gb backbone in the data center. Linking two 24 port PoE switches in the office to connect and power IP phones, wireless APs, desktops and laptops. Then running two wires to link two 8 port PoE switches in the warehouse for IP surveillance. Figure 1: Deploying FS 48 port gigabit switch with 10Gb uplink as core switch and FS 8/24 port gigabit PoE switches as access switches. What Is 10Gb Backbone 10GbE Switch? Similarly, 10Gb backbone refers to the configuration that 10GbE switch serves as core switch in the data center. Then running gigabit switches with 10Gb uplink back to the central 10Gb switch. To illustrate 10Gb backbone configuration, here is a deployment scenario. In this case, we deploy S5800-8TF12S 10Gb SFP+ switch as core 10GbE switch in the data center. Using S3800-48T4S 48 port switch and S1600-48T4S 48 port gigabit PoE switch as access switches, we run fiber patch cables to corresponding 10Gb SFP+ uplinks on these access switches. As thus the 10Gb uplink bandwidth can be divided to the access gigabit switch normal port. Assumption on the case 10 same endpoints are connected to 10 ports on the gigabit Ethernet switch. Then each can obtain max. 1000Mb from the 10Gb uplink bandwidth. In this case the gigabit speed is retained. If the upper layer switch is a gigabit switch, then each endpoint can only get 100Mb. 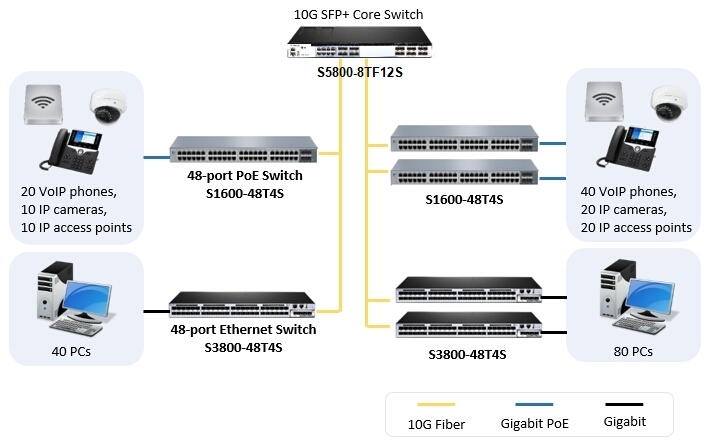 Figure 2: Deploying S5800-8TF12S 10Gb SFP+ switch as 10Gb backbone, while S3800-48T4S 48 port switch and S1600-48T4S 48 port gigabit PoE switch are for gigabit access switch. 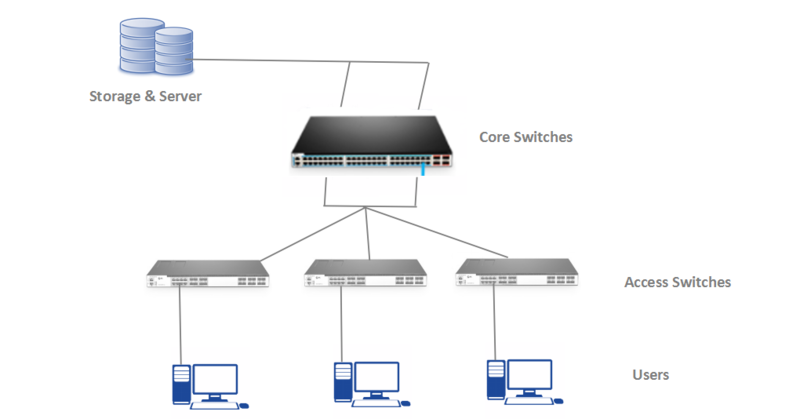 1Gb Backbone vs 10Gb Backbone: Gigabit Switch or 10GbE Switch as Core Switch? Generally speaking, deploying gigabit switch for a 1Gb backbone vs 10GbE switch for a 10Gb backbone depends heavily on virtualization application. Even in a small office with only several PCs, demanding applications for high bandwidth may require a backbone 10Gb switch. That is, if you or your employees must deal with high-load pictures and videos every day, 10GbE switch backbone is a must to ensure smooth operation and work efficiency. Or you may easily get stuck in network congestion. Say a regular video conference in a midsize enterprise can randomly drop, which wastes time and drag down schedule process. Also, pay attention to number of users. Counting all the current endpoints: computers, wireless APs, IP phones, etc. And try to measure the load traffic by plotting utilization. Then take future expansion into consideration. If your backbone gigabit switch ports are already hot for using the most bandwidth provided, and you still need to add office devices, then your network is on the verge of severe congestion. In this case 10Gb switch backbone or higher is the choice to go. All in all, choosing between backbone gigabit switch vs backbone 10GbE switch, there is a bandwidth gap that access endpoints are available. If you deploy 10Gb switch as core switch and gigabit switch with 10Gb uplink as access switch, the normal port on the access switch can get max. 1000Mb bandwidth. However, if the backbone is 1Gb and your access switch is 100Mb, then only max. 100Mb bandwidth can be available in the access switch port. So for 1Gb backbone scenario where one use gigabit switch as core switch, deploying gigabit PoE switch instead of 100Mb switch as access switch is a solution to keep up with 1000Mbps speed. In summary, 1 Gb backbone gigabit switch vs 10Gb backbone 10GbE switch selection depends on the bandwidth your virtualization applications require. In detail, 10Gb switch shall function as 10Gb backbone in the case mass data transfer is a regular task. Thus the gigabit switch normal ports can share max. 1Gb bandwidth. Otherwise you can remain your 1Gb backbone. But for 1Gb access, deploying gigabit PoE switch to replace your 100Mb access switch is a future-proofing and feasible solution to go. FS SFP switch is a good choice for 1Gb backbone core switch whereas SFP+ switch for 10Gb backbone core switch. Since the introduction of 10 Gigabit Ethernet, the ever-increasing demand for high bandwidth has been driving the pervasive application of 10Gb Ethernet switch. However, for its high cost it is normally limited to the enterprise and server market and doors are shut down for home individual users. Nevertheless, gamers and speed addicts always hanker for the faster hardware, so the demand for high bandwidth at home provided by 10Gb switch is rising too. Only once attempt to 10GbE, one will never want to turn back to 1 Gigabit Ethernet. Generally, there are several versions of 10GbE switch. The first is 1GbE switch with a few 10Gb SFP+ uplinks, such as FS S5800-48F4S 48 port 1GbE SFP switch with 4 10GE SFP+ ports ($1699). 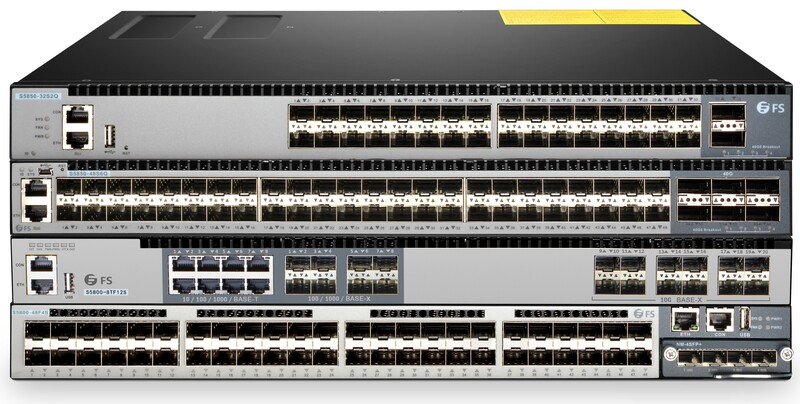 The second is 10GbE switch with 10Gbase-T ports or 10GE SFP+ ports as main connection, such as FS S5900-24S 24 10GE SFP+ switch ($1999). Another is 10GbE switch with a few 40/100G QSFP+ uplinks, such as FS N5850-48S6Q 10GbE ToR/Leaf switch with 6 QSFP+ 40GbE ports ($2999). For 10Gb home Ethernet, the former two switches can be taken into consideration for their cheaper price. Especially for the first type, it is very popular for building 10Gb home network. Here are some reasons. First, one can connect the host, virtualized server and workstation with the 10Gb links. Second, 10Gb SFP+ connection usually costs less power and expense than 10Gbase-T switch. Table below lists the most cost-effective 10Gb switches provided by FS.COM. How One Benefits from 10Gb Switch for Home? As we know, we can connect 10G NICs directly and interconnect devices with 10Gb SFP+ cables to achieve 10Gb network. Thus many people get confused about one question: why not using cheaper 10G NICs rather than expensive 10Gb switch? For very small 10G network with a few computers, NICs indeed can be a solution. But how about home networks with more users? For instance, you have 4 computers, then you need to buy 8 total 10G NICs and corresponding cables for connection, which can lead to expensive additional cost for expansion. So at this point home users need to think about deploying a 10Gb switch. Moreover, 10Gb switch features low- latency, fewer bottlenecks, simple virtualized environment, spare bandwidth, rack space efficiency, low power consumption and expansion flexibility. How to Build 10Gb Switch for Home? To set up a 10Gb home network, several components are required. 10GbE core switch, access switch with 10G uplinks, 10G network interface card (NIC) for storage and server, and 10G cabling. For 10G switch selection for home, maybe you should avoid some brand-name vendors for their high expense. FS specially designed S3800-48T4S 10Gb switch for home users with a low offer at $499 ($479 with single power). It has 48 1000Base-T ports with 4 10GbE SFP+ links. For 10G cabling selection, there are RJ45 copper cable and SFP+ fiber capable of working with 10Gb/s. Usually, home users have no need to switch from Ethernet copper cabling to fiber cabling. But for 10Gb speed, you’d better use Cat6a or Cat7 Ethernet cables to resist interference. And for NACs and severs with 10G SFP+ links, the most cost-effective solution is to use 10G (Direct Attach Cable) DAC. It is a copper cable with SFP connection on each side available for various lengths. For example, FS SFP-10G-DAC, Cisco compatible SFP+ to SFP+ connection, is a passive direct attach copper twinax cable with length ranging from 0.5m to 7m. This article focused on the 10Gb switch for home usage. It introduced the main types of 10Gb switch available for home users. And gave some practical recommendations under cost-efficient considerations for building 10GbE home network. For gamers and any other Tech or speed pursuers, deploying 10Gb switches for home network will provide you superior experience of high bandwidth. FS provides 10Gb switch with 12/24/32/48 ports for different requirements. You can visit our official website for more information. Catching a glance of the modern network devices, one will see different ports are built in for different connection. For instance, we got USB interfaces in cellphones and RJ45 ports in copper switch. But how about SFP port? SFP port is built-in interface in various devices including gigabit switch, SFP switch, network interface card (NIC). This article will focus on the understanding of SFP ports on SFP switch. What Are SFP Ports on SFP Switch? SFP port (mini-GBIC port), a small form-factor hot pluggable interface, is designed for high speed and density SFP connection. It is typically built in 10Gb switch with SFP+ uplinks. Different from RJ45 ports for copper connection only, SFP ports on SFP switch support both copper and optical links. When SFP ports on SFP switches are inserted into SFP modules with electrical ports, Ethernet copper cables (Cat5e/Cat6/Cat7) are needed for data transmission. When SFP ports are plugged by SFP optical modules with optical ports, fiber patch cables are required for data transmission. 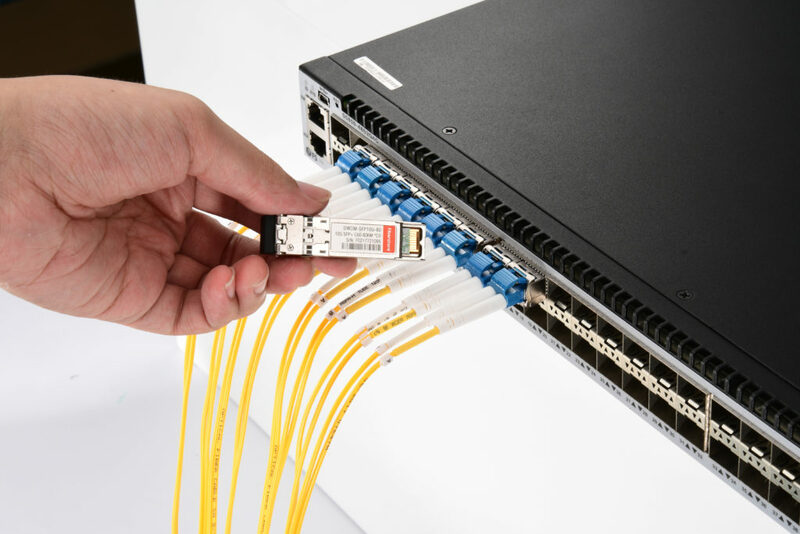 Counting to this feature, SFP ports empower SFP switches the switching function to connect various Ethernet and fiber cables through the network. For the fiber one, single mode fiber (SMF) and multimode fiber (MMF), 1GE and 10 GE speed are all compatible. Moreover, it contributes to the adaptability of either short distance transmission by deploying RJ45 SFP or long distance transmission by fiber SFP. Figure 1: This is a demonstration of SFP ports on FS SFP switch plugged by fiber SFP modules, then connect single mode fibers for data transmission. Compared with early GBIC module port, SFP port for SFP module has much lower volume ratio. This small-sized optimization enables 2 times the density for SFP ports configuration on the same patch panel. Thus also expands the whole data capacity. Besides, SFP port is an I/O device, which is hot-swappable. 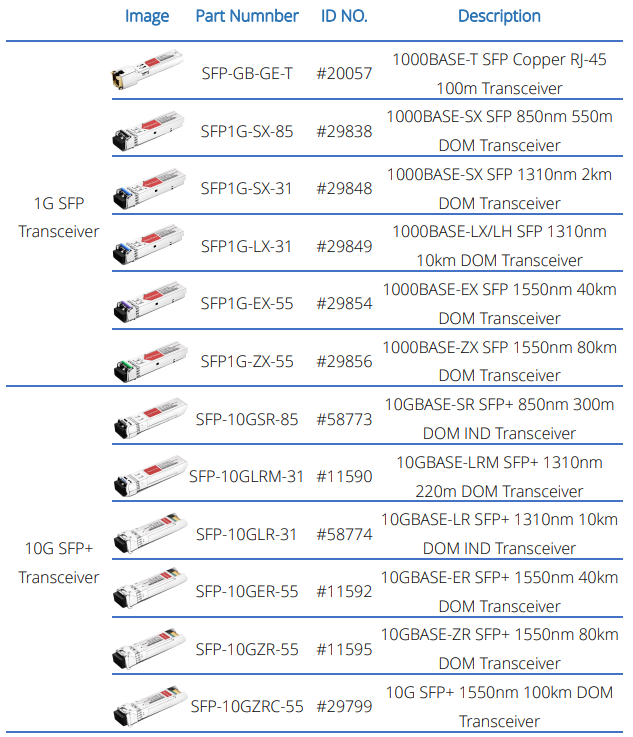 Moreover, SFP ports on SFP switches can be exchanged with different port types, such as 1000Base-SX, 1000Base-LX/LH, 1000Base-ZX and 1000BX10-DU. Fiber SFP plugged into SFP port on SFP switch usually connects with a fiber cable, which delivers data in light rather than electrical signal. First, for reliability concern, it largely diminished data loss and electromagnetic interference. Second, for security concern, fiber jumpers are less likely to catch on a fire than copper cables in severe environment. Sensitive data information is also more difficult to be illegally filched. Gigabit switch often has built-in SFP ports and SFP+ ports. They can support the load blancing of redundant links. Even though currently you only need 1GE network, for the concern of later system upgrade and future-proof technology, 10GE SFP+ ports are necessary for SFP switch. How to Use SFP Ports on a SFP switch? To illustrate the usage of SFP ports on a SFP switch, taking FS S5800-48F4S 10gb switch as an example. FS S5800-48F4S 48 port gigabit SFP switch comes with 48 x 1GbE SFP ports and 4 x 10GbE SFP+ ports. It has a 176Gbps switching capacity with low latency in a cmpact of 1U form factor. It is a 10GbE L2/L3 carrier access switch designed for a variety of data center enterprise Ethernet networks, including MPLS, IPv4/IPv6, sFLOW, PIM-SM, PIM-SSM. To use SFP ports on FS S5800-48F4S SFP switch, there are two solutions for network application. S5800-48F4S can not only provide access points for high density GE servers, but also 4 x 10GE uplink points to Aggregation or Core switches. 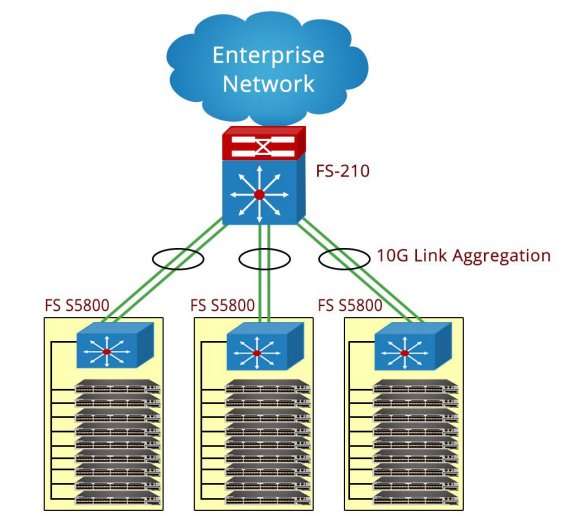 Figure 2: Using S5800-48F4S for data center access network topology as ToR access devices. S5800-48F4S is ideal for service provider Metro Ethernet access deployment, allowing providers to offer convergent application portfolio to their enterprise or individual users. Typically S5800-48F4S SFP switch is installed in a building basement, which serves many customers in the branch building or at the head office. To use SFP switch, corresponding modules are required for connecting cables with SFP ports. Table below lists the FS supported SFP and SFP+ modules for S5800-48F4S SFP switch SFP ports and SFP+ ports. From the above illustration, SFP port on SFP switch is a port type to cater for high-capacity long-reach networks. It can be either connected to Ethernet copper cable with RJ45 SFP module, or optical fiber cable with fiber SFP module. Thus it supports both short and long reach distance. It also owns the pros of small size, hot-pluggable capability, high reliability and security. FS S5800/S5850/S8085 series SFP switches are high compatible with mainstream band switches such as Cisco and Juniper. If you have any need in SFP switch, FS.COM can be a good choice.